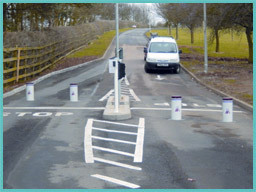 For commercial and industrial premises we provide a range of traffic control bollards and rising arm barriers to suit a variety of applications. These are fast acting systems, moving from open to closed positions in 3 to 8 seconds and suitable for busy entrances where an automated gate would be too slow. Barriers and Bollards are used both stand alone, and in conjunction with security gates which are closed out of normal business hours to provide intruder security. Rising Bollards provide a neat solution to preventing the passage of vehicles without the requirement for gates and have a minimal impact on the environment for town centres and historic areas. They provide traffic control that disappears flush with ground level and are aesthetically pleasing and impassable to traffic however still allowing access to pedestrians. 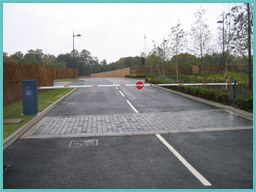 Bollards can be used individually or in multiples for wider entrances. Anti ram raid for shopping precincts etc. Control of pedestrianised areas for traffic limitation. Replacement of traffic barriers in vandal problem areas.